May | 2017 | Mike Lamberti, From Margate To Cleveland, And Back ! The smile never seems to waver, whether it’s a win, or a loss. 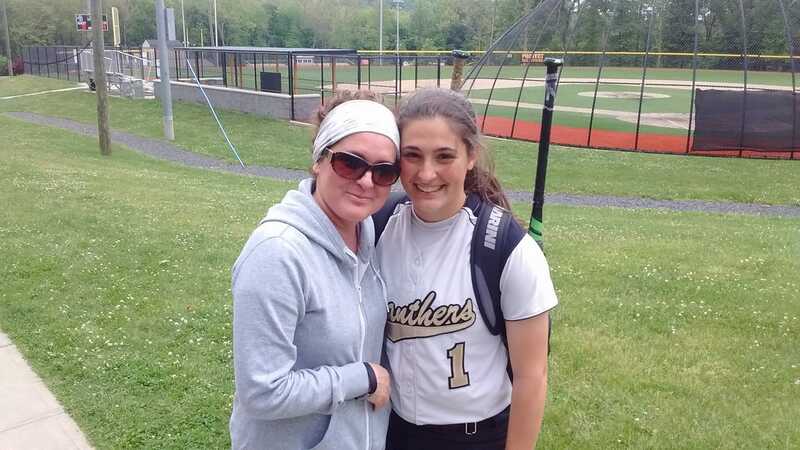 Mia Faieta of Cedar Grove has learned to love playing softball for the simple joy of competition. But even she had to be surprised by what happened on May 26, in a state sectional semifinal win over North Warren. 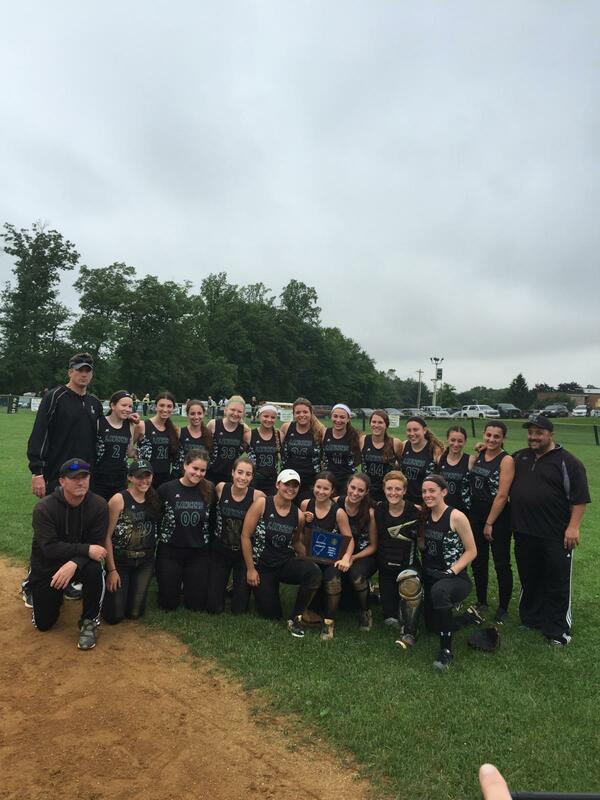 Faieta struck out every batter she faced in a seven inning perfect game, as Cedar Grove (19-7) advanced to the NJSIAA, North Jersey, Section 2, Group 1 championship game, at Verona, scheduled for May 30, after a 4-0 win over a tough North Warren squad. After throwing the gem, Faieta was greeted by her mother, Fran, as well as Cedar Grove fans who kidded she wasn’t throwing the ball hard enough. Typically, the sophomore just smiled, as she soaked in the accomplishment in what was Cedar Grove’s last home game of the 2017 season. North Warren, which won its conference in 2017, played a solid game after a tough first inning. Fans raved about Faieta’s velocity and control. Fran Faieta, Mia’s mother, couldn’t have been prouder, both with the pitching and her daughter preparing her own breakfast the morning of the game. 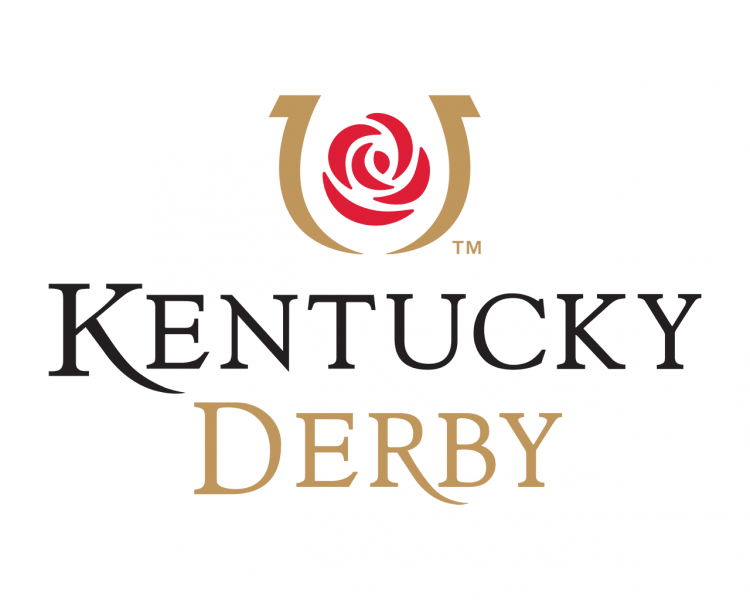 With the Kentucky Derby set for May 6, the studs are taking center stage. In Essex County softball, that’s always the case, but last week, it was very apparent. Mount St. Dominic won both its games at its tournament on April 29, blanking Red Bank Catholic, 9-0, and St. Anthony (NY), 4-0. Kelsey Oh (American Pharoah) was brilliant, pitching a no-hitter with 16 strikeouts in the win over St. Anthony after Julianna Kocenski spun a shutout in the opening game. Mount St. Dominic’s pitching is tremendous. Oh is Oh, and she’s incredible, but Kocenski and freshman Ali Winters will continue the winning tradition next year for the Lions. Winters, just a freshman, pitched an excellent game on May 1 against West Essex. Head coach Lorenzo Sozio’s Lions have a big game scheduled on May 4, at Ivy Hill Park, opposite a strong Notre Dame team, starting at 7 p.m. Could be a preview of the Non-Public A championship, in what is a very talented state bracket. Mia Faieta (California Chrome) had another big week in the circle, as the Cedar Grove sophomore struck out 15 and threw a 1-hitter in a win over Columbia. Faieta is averaging nearly 15 strikeouts a game. Immaculate Heart Academy’s Ally Dudek made a Sam Corio-type catch in her teams win over Newark Academy on April 29, at the Coaches vs. Cancer Classic, in Park Ridge. Dudek reached over the left field fence to deny a homer by Sam Burggraf. Ironically, in May, 2016, Corio leaped at the fence, in Bloomfield, to rob the talented Burggraf of a homer. (And if you’ve seen Burggraf play, you know there will be a lot more balls hit way over the fence, as there already have been, that won’t be caught. That kid can flat out hit). 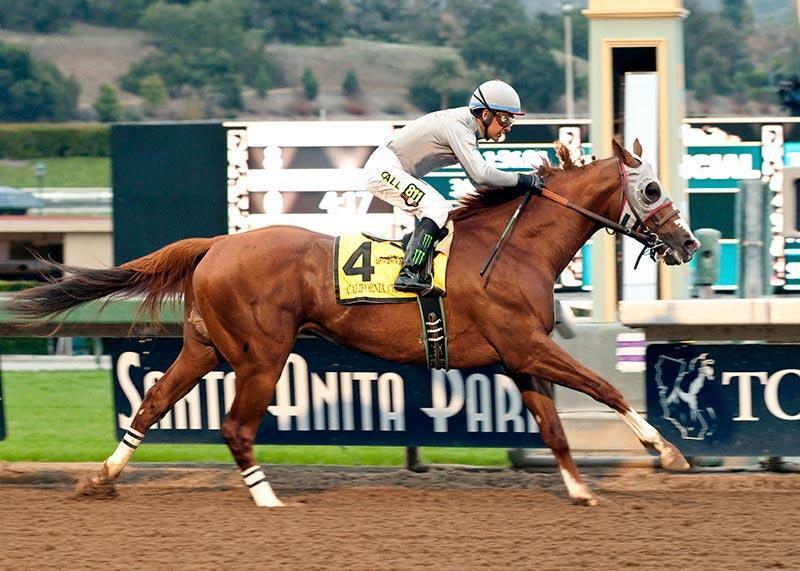 The unassuming Dudek is the new ‘Alysheba‘. She just makes plays, both in left field, and at the plate. 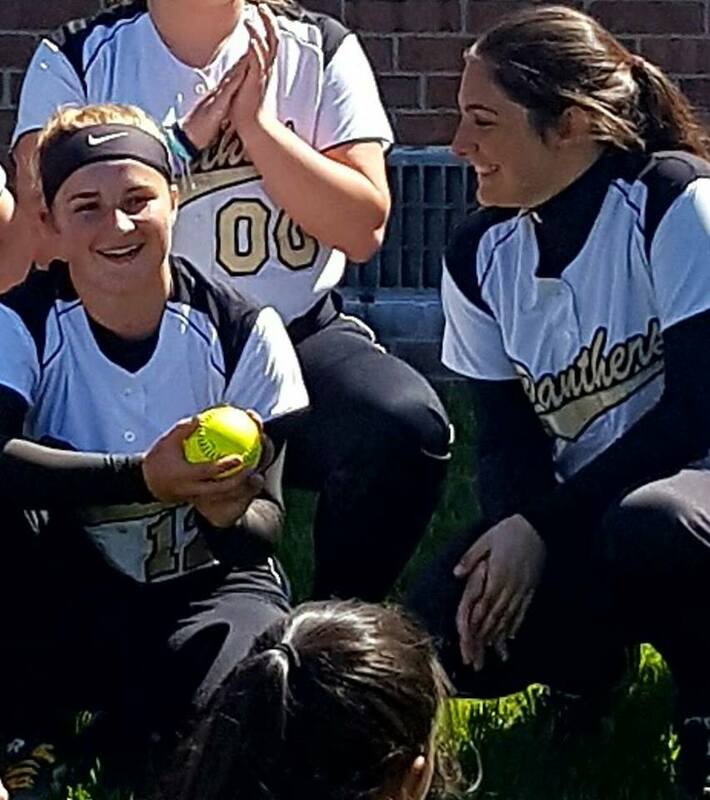 It was Dudek’s single that scored Reagan Jones with the winning run two weeks ago in a marvelous game against West Essex, as the Eagles won, 2-1, at the Black and Gold Tournament. 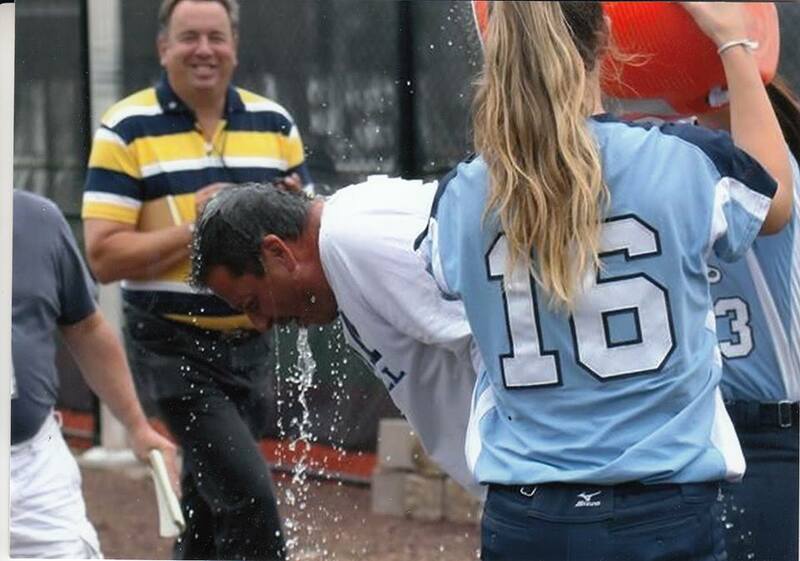 And don’t forget, on June 6, 2015, as a sophomore, Dudek also singled home Jones with the game-winning run, and this time, it was for a state championship, as IHA defeated Notre Dame, 1-0, at Kean University. Dudek plans to attend the University of Dayton this fall. 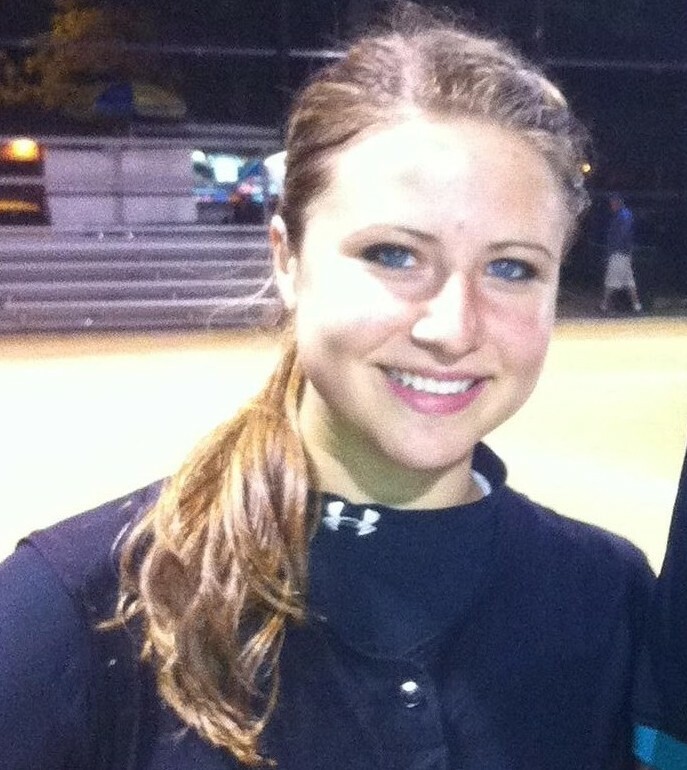 Another stud is back in form at Montclair, as Jess Masur (Nyquist) spun a shutout against Cedar Grove on May 1, 2-0. Masur led Montclair to the Essex County Tournament championship game in 2016 and now appears to be hitting her dominant form, as the Mounties look to repeat last year’s heroics, as well as earning a berth in the NJSIAA Tournament, which eluded the team a year ago. 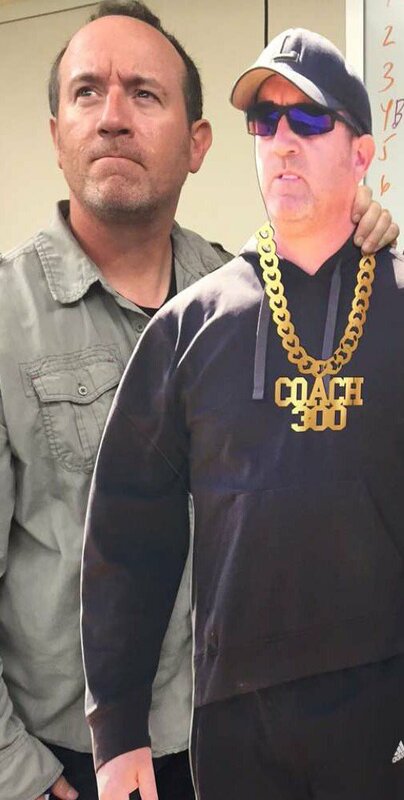 What more can you say about Caldwell coaches Mike Teshkoyan and his brother, Mark Teshkoyan? 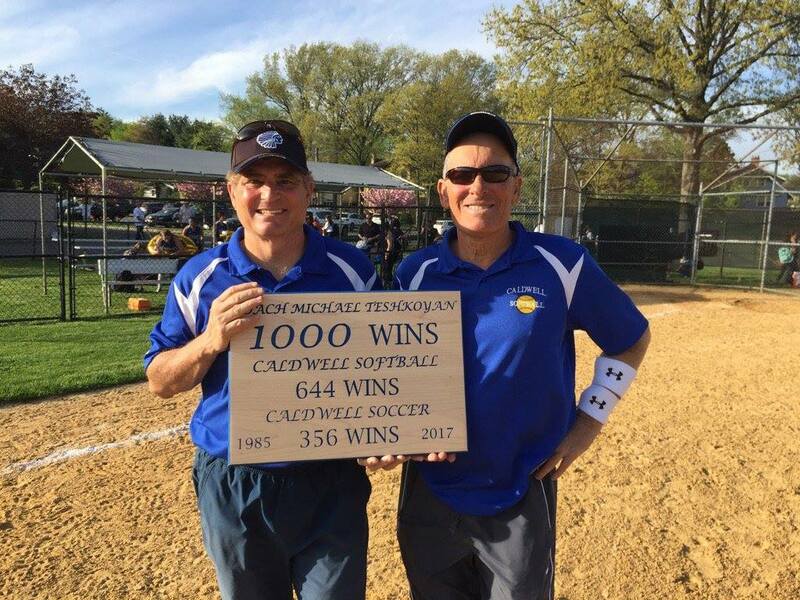 The all time winningest coach in Essex County softball (644 wins, and counting) garnered his 1,000th career win as a varsity head coach, all at Caldwell, last week as the Chiefs downed Montclair Kimberley, on April 28. The Teshkoyans also coach the girls soccer team at Caldwell, where the duo has accounted for 356 victories. The Teshkoyans, Mike (left) and Mark. “Sharing this milestone with Mark is at the top of the list for me, we’ve been together for 63 seasons, and I couldn’t run our two programs without his loyalty, dedication and passion for trying to make our teams the best they can be,” said Mike Teshkoyan of his brother. Will have much more on the milestone in an upcoming blog. Here is the updated FMTC, Top 10. Montclair moves up and Millburn jumps in. 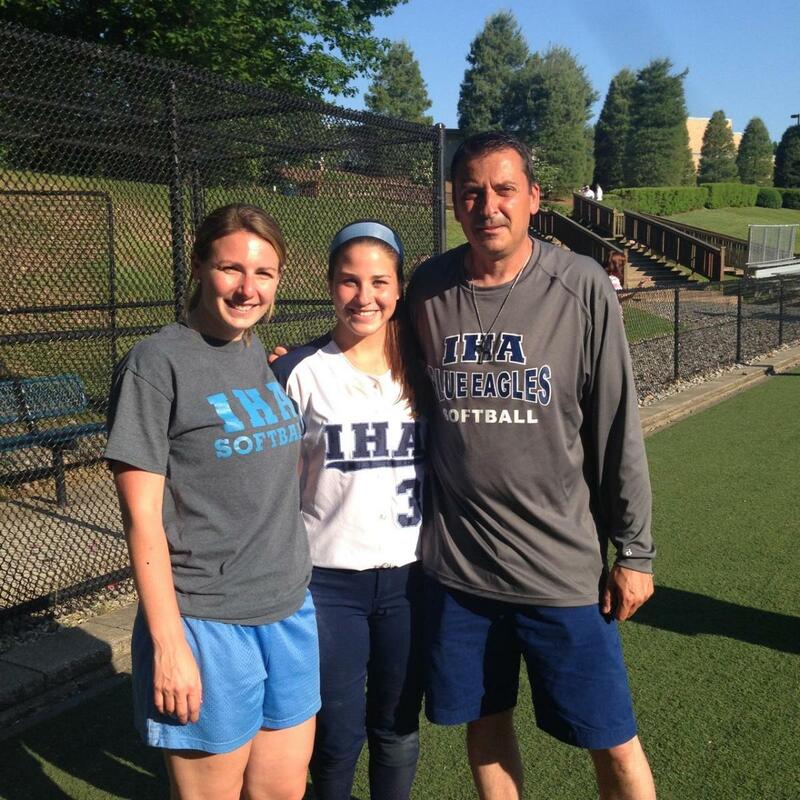 Anything associated with the Immaculate Heart Academy softball program was second nature to its legendary coach, Anthony LaRezza. When records were set, LaRezza was the first to acknowledge it. 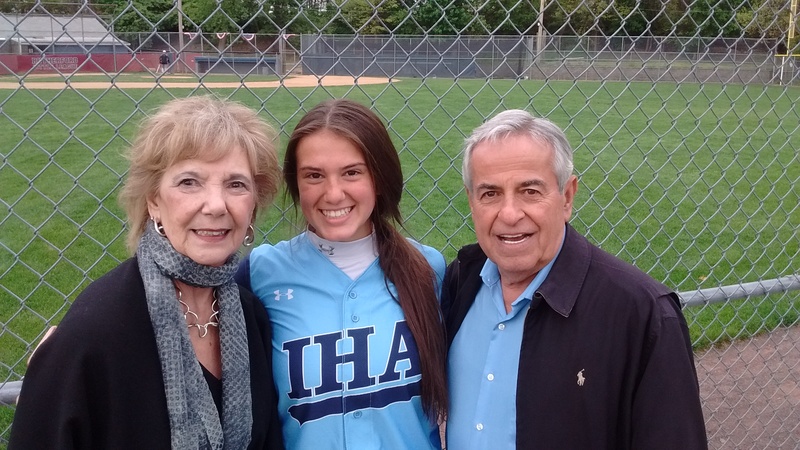 So, when Reese Guevarra (Sunday Silence) became IHA’s all-time leader for career hits on May 2, in a game at Paramus Catholic, there was the thought that Anthony was indeed smiling. Guevarra, a senior who will play at the University of Connecticut this fall, surpassed the great Carly Piccinich as her school’s hit leader, with two singles, as IHA won, 5-1. She now has 187 hits and her hot bat of late has helped IHA (15-2) win 13 straight games, after a pair of 2-1 setbacks in early April. Guevarra and head coach Diana Fasano are joined by other IHA players to celebrate Reese’s new record. Only thing missing in the post-game celebration was a recording of Neil Diamond’s ‘Sweet Caroline’. So, here it is, if you want to listen while reading. 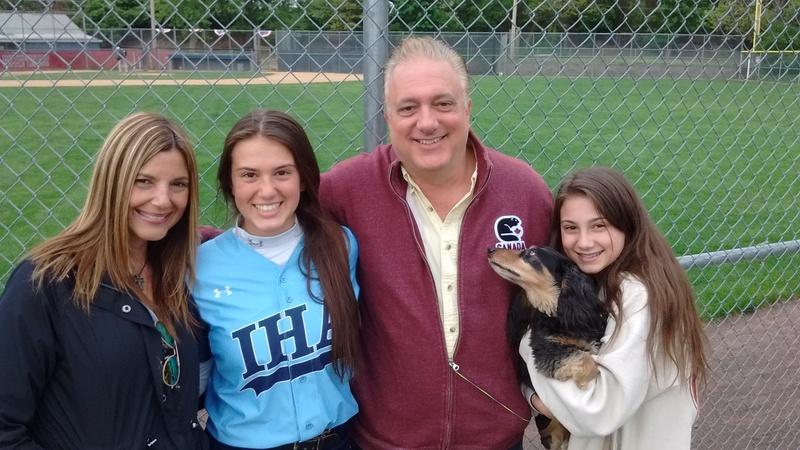 IHA catcher Mia Recenello had another two hits in the Paramus Catholic game, after a big game against Pequannock, which included a ‘Natural’ like homer which hit the scoreboard and wrapped up a victory, on April 30, in Rutherford. Recenello also had the chance to celebrate a nice win with her grandmother, Joan, and Joan’s close friend, George, as well as Mia’s parents, Kristen and Sam, younger sister, Talia, and family pet. 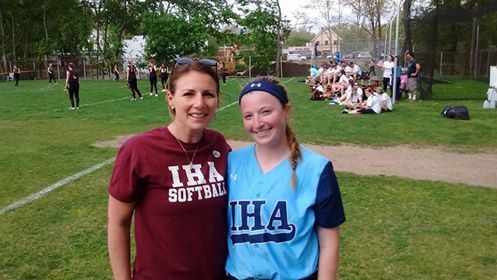 The IHA pitching has been tremendous all season, as senior lefty Olivia Sprofera continues to be the ‘Citation-esque‘ pitcher which makes her perhaps the best in the state. And the play of freshman Ryleigh White has really stepped up. White is beginning to dominate in the circle and the righthander also leads IHA in homers, with five, including one against Paramus Catholic. The Bergen County Tournament will begin play this weekend, and IHA will be hosting games on May 6 and 7. The defending champion Eagles could be either the first or second seed. It was May 8, 2012, and two undefeated New Jersey high school softball teams were scheduled to play a 7 p.m. game at Ivy Hill Park. Immaculate Heart Academy was ranked first in the state while Livingston was second. Both teams had standout pitchers and a marvelous lineup. Unfortunately, the game never happened. Light rain at 4 p.m., which didn’t affect a nearby game as Columbia played Caldwell that afternoon, somehow forced a cancellation of a 7 p.m. game, when there was no rain and, in fact, the sun was out. Since it was not a conference game, the contest could not be made up. But, five years later, it’s an interesting time to look back at what may have been, in The Game That Never Was. 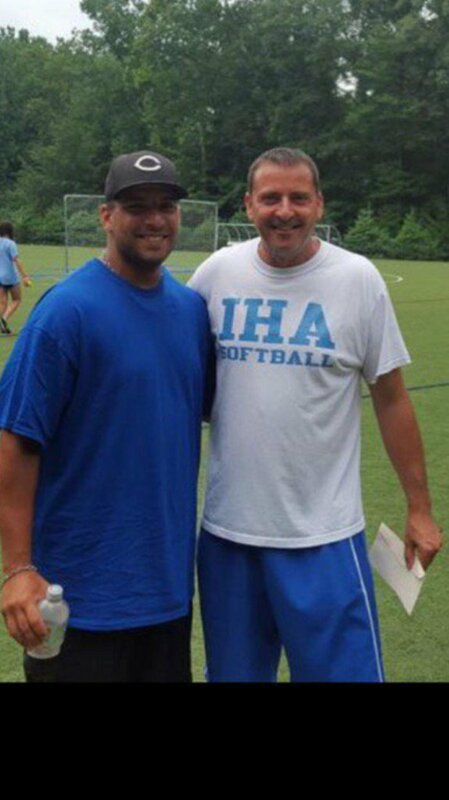 Anthony LaRezza was IHA’s coach while Jason Daily led Livingston. LaRezza and Daily were friends and had high respect for each other’s program. LaRezza would always have kind words for the opposition, but he particularly liked Livingston. 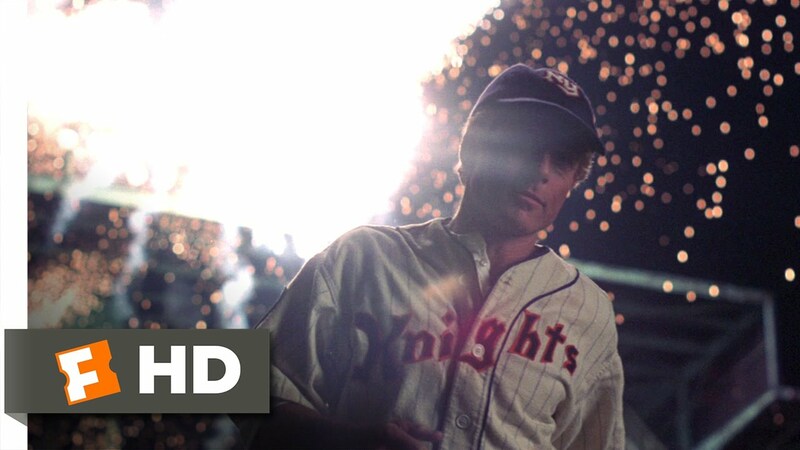 Quite often, he’d be seen in the stands, watching Livingston play, on days when IHA was off. “They were really good,” LaRezza would say of Livingston, in 2014, in looking back at that game. “We didn’t play Livingston, a lot, but it was fun when we did. And it was always a tough game. Jason is a great guy, and his teams are always prepared. Jess Peslak was 26-1 in 2012. Peslak, dubbed Secretariat, would finish the 2012 season with some incredible numbers, including a 26-1 record, with a 0.32 ERA while leading Livingston to arguably its best season in the program’s history. Peslak fanned 307 in 175 2/3 innings of work while walking 37. She also had 19 shutouts, including five-no hitters and nine one-hitters. She fanned a season high 17 in a win over West Essex in the Essex County Tournament semifinals and recorded double figures in strikeouts 20 times. Peslak, now a senior at Hofstra University and still pitching, opened the 2012 season by not allowing an earned run in her first 73 innings. She wound down the year by not yielding a run, earned, or unearned, from April 27 to June 5, a span of 82 1/3 innings during which she threw 11 straight shutouts while also making a few relief appearances. Ultimately, Peslak gave up one earned run in her final 88 2/3 innings. I often said that LaRezza’s famous 2010 ‘Memorial Day speech’ was a classic, and it came on the heals a 1-0 loss to Livingston, at the IHA Tournament. In that game, Peslak, then a freshman, didn’t pitch, but she drove in the winning run. Daily had equal respect for LaRezza. 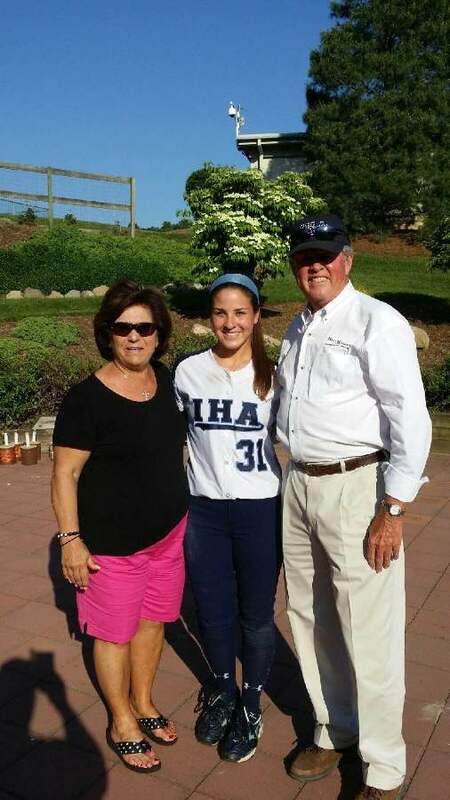 IHA had a marvelous pitcher, too, in Steph Thomas, who was a sophomore in 2012. Thomas, of course, would go on to win a state-record 113 career games and is now a standout pitcher at Lafayette College. The eventual Gatorade Player of the Year in 2014, Thomas (aka Affirmed) would not only lead the state in career wins, but her 68 shutouts was also a state record. 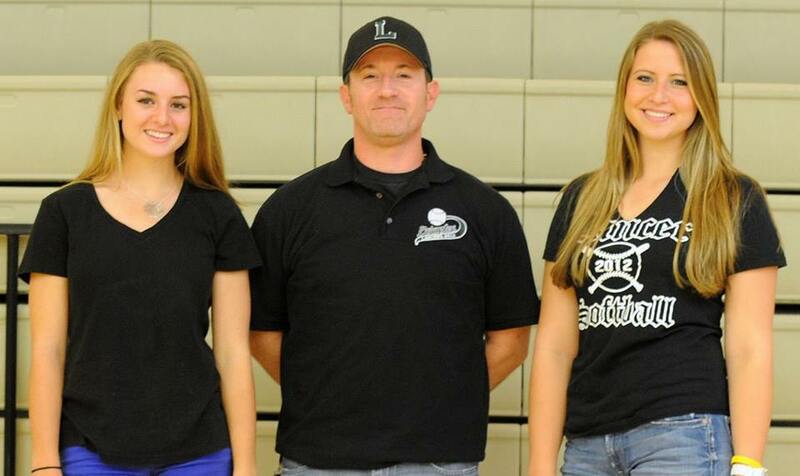 Steph Thomas (center) with then assistant coach Diana Fasano and head coach Anthony LaRezza, in 2014. In 2014, alone, Thomas was 31-2 with 285 strikeouts and just 17 walks in 193 innings, while pitching to an earned run average of 0.47. She also hit .532 with 11 doubles and 23 RBI. For her career, Thomas had 951 strikeouts and an ERA of 0.54. And she could flat-out hit, too. LaRezza, a tough grader for his own players, said this to NorthJerseySports.com in 2014 about Thomas. Steph Thomas celebrated win number 113 with her grandparents three years ago. So, who would have won that game in 2012? We’ll obviously never know. But here’s a look at the lineups from that season, as both teams had tremendous hitters, but it’s hard to tell how much offense would have been generated that night, with the quality of the pitching. It should be noted that IHA and Livingston did play in 2013, at an early season tournament at Mount St. Dominic, and IHA won, 5-2. IHA would finish 32-0 in 2012 and be ranked the state’s best team. Livingston would win a conference, county and state sectional title, but were defeated in the Group 4 semifinal by Hunterdon Central. The Lancers finished 29-1 that year. After meeting in 2013, Livingston and IHA would go on to excellent seasons. The Lancers would win the conference, county and state sectional titles again, before losing in the Group 4 semifinal to Watchung Hills. Always influential coaches, Anthony LaRezza and Jason Daily helped younger coaches. Phil Delgado (standing next to Anthony) was very close to LaRezza and always respected Daily. IHA would win another Bergen County and conference championship, before losing to St. John Vianney in the 2013 Non-Public A final. 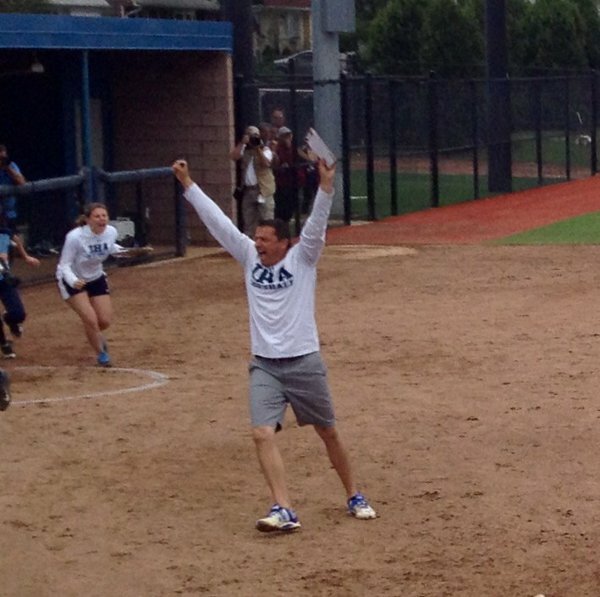 Two years later, LaRezza would lead IHA to another state championship, with the famous Sean Reilly photo of LaRezza jumping for joy after the win. Two hundred forty three days after that title, LaRezza passed away, but his legacy remained strong, as IHA went on to another state championship in 2016. Livingston would also win a third state sectional championship in five seasons in 2016, under Daily’s guidance. He remains one of the best coaches in North Jersey. As for The Game That Never Was? I’ll go with Livingston, 2-1, in 8 innings. Livingston won a big Super Essex Conference American Division game, rallying for two runs in the bottom of the seventh to edge a feisty Nutley team, 7-6, in Livingston. The Lancers (7-8) appeared to have the game under control, holding a 5-0 lead in the top of the sixth, before Nutley (7-7) answered with four runs, then took the lead in the seventh with two more. Livingston responded, scoring two in the last of the seventh, capped off by an RBI single from Alex Moresco. 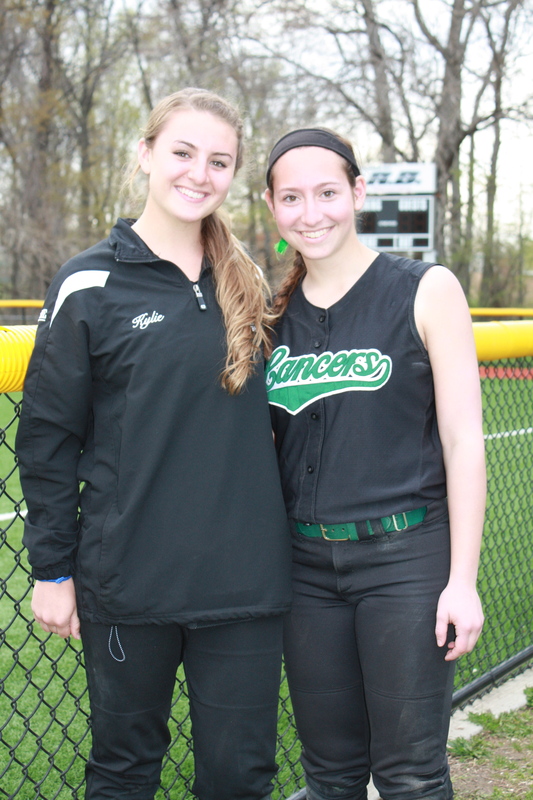 Livingston snapped a four game losing streak to Nutley and defeated the Raiders, at the Shangri La home field, for the first time since Jess Peslak was pitching for the team, in 2013. Livingston and Nutley are almost mirror images of each other. They’re both young teams, learning the game, while playing a rugged schedule, with strong veteran head coaches. Luann Zullo has been at the helm in Nutley for 19 seasons now while Daily is in his 17th season. Both teams have talented youngsters in the lineup. Nutley pitcher Courtney Wilde, a sophomore, gets better with each game, and she’s also a force at the plate, batting third in the lineup.Wilde was 2-for-4 against Livingston. Junior shortstop Melanie Conca is a force at the plate and senior Sam Echevarria is a tremendous second baseman who started Nutley’s sixth inning rally with a lead off single. Another senior, Lauren Hogan, plays a solid first base and has an effective bat. 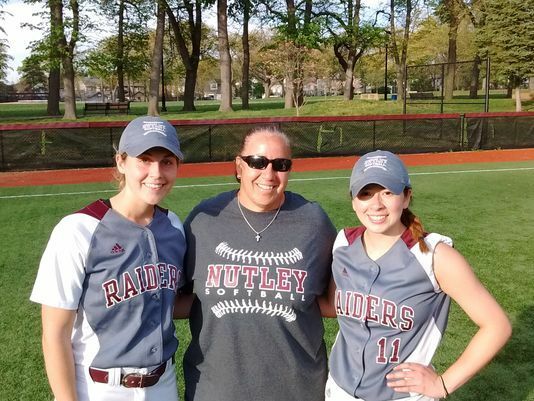 Nutley coach Luann Zullo, here with Lauren Hogan (left) and Sam Echevarria. Livingston shortstop Ashley Reuter, a junior, and freshman second baseman Nicolette Luzzi give the Lancers a tremendous middle infield defense, and both are excellent hitters. Jaclyn Williamson had three hits in the win over Nutley and started the winning rally in the seventh with a single. Kaitlyn Kelly, who drove in two runs, followed with a single, and a throwing error allowed Wiliamson to score the tying run. After a ground out, a key two-out walk by Chloe Saperstein set the stage for Moresco, the number nine hitter in the lineup, and she came through, with an opposite-field single which plated Kelly with the winning run. Livingston’s Emma Cooney, one of the best defensive catchers in the county, scored two runs and Lancers pitcher Jess Gorman pitched well. She didn’t allow a baserunner through 3 2/3 innings and had a shutout into the sixth.